When taking a refractometer measurement of wort, the Brix reading is not necessarily accurate. What is obtained is the Brix WRI (wort refraction index). Only after dividing the Brix WRI by the wort correction factor is the actual Brix known. It is helpful to know that Brix and Plato are nominally the same to 3 decimal places, so the corrected reading can be treated as Plato (°P). The correction factor is needed because wort has a different density than sugar water which refractometers are designed for. The wort correction factor is specific to the instrument. Download our spreadsheet that allows tracking multiple observations. We recommend at least 30 samples from several different unfermented worts. Only unfermented wort is appropriate for this test, because alcohol throws off the refractometer reading. 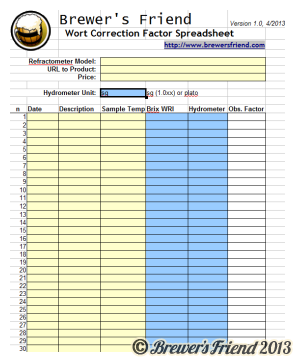 Filling out the spreadsheet will also tell how accurate the refractometer is in general. 5x refractometer measurements from 6 different worts provide a nice wide sample. Some cheaper refractometers report wide ranges (2-3 points) sample to sample from the same wort. In that case, the average of several samples should always be taken before recording the gravity in your brew log. It is easy to get started using 2oz of DME in 8 ounces of water. From there, add data to the spreadsheet over the new few brew sessions to dial it in more closely. Remember, the unadjusted wort reading is Brix WRI. Only after dividing Brix WRI by the wort correction factor do we arrive at the actual Brix. At that point, Brix and Plato are interchangeable units for home brewing purposes. Brix WRI of 19 measured. 19 / 1.04 = 18.26 – the actual Brix (unfermented wort only). Calibrate your refractometer with water to read zero. Have on hand, a hydrometer, and know its offset. It should read 1.000 in water at 68F if the hydrometer is calibrated to 68F. If it does not read 1.000, adjust subsequent hydrometer readings by the offset. If you don’t have unfermented wort on hand, create a wort solution that is roughly 20 &deg;P / 1.083. Mix 2 ounces of DME in 8 ounces of water (same as 56.7 grams of DME in 250 ml of water). Mix up the solution thoroughly and let it sit for 15 minutes so it fully dissolves. It should be a translucent golden color with no haze or fizzing. Measure the solution with the refractometer, record the value – this is your Brix WRI, the unadjusted reading. Enter the data in the spreadsheet and it will update the correction factor for that observation, and the overall average. To find the correction factor on your own, divide the hydrometer value (converted to Plato / Brix) by the refractometer value (Brix WRI). Repeat the measurements with different worts (across your next several brew sessions). 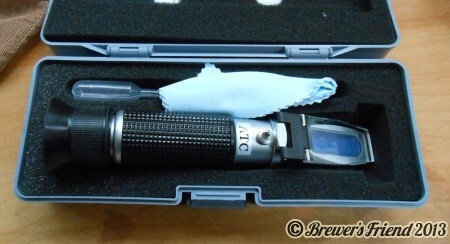 Check the calibration at different temperatures of the refractometer to determine if the ATC is working. The average value of all your samples is the final wort correction factor. Note any patterns present and the overall accuracy. Let us know your results! We have a forum topic setup for this.